Mexican auteur Carlos Reygadas’ fourth film, Post Tenebras Lux (2012), has been described by some as his masterpiece. It’s a bracingly intelligent and formally daring picture; a confrontational, yet moving work of subversive autobiography which is open to many interpretations. It’s a film that bridges the personal and the political, using one Mexican man’s personal crisis to signify larger fissures in the national consciousness. Post Tenebras Lux has proven typically divisive with critics, but is just the kind of film which demands an audience’s attention, adventurousness and, ultimately, faith. CineVue’s Craig Williams spoke to the director about art, politics and cinema as an act of life. Craig Williams: How did Post Tenebras Lux come about? Was it something that had been gestating for a while, or did you only turn your mind to it after finishing Silent Light? Carlos Reygadas: After Silent Light, I had children and decided to build the house where I live which is also the house in the film. And I just sort of forgot about cinema to a large extent during those years. I didn’t want to make films and I didn’t think about making films. Eventually, I had the need to make a film of the things I’d felt and experienced or at least thought of during those years. And this was the film. I wrote it very quickly; in a couple of days. All the information was there before; it had been building for a while but I wasn’t conscious that it was information to be used for a film. It was just ideas, experience, information and thoughts. CW: Does Post Tenebras Lux confirm that, the more you unhinge yourself from the comfort of family, the more you allow your personal problems to define who you are? CR: I pretty much agree with that idea but I wasn’t purposefully aiming for it. It’s in the film because it’s an idea that I have and it comes out naturally, organically, as a sub-product of making something. When you make something that’s not a clock, a computer or a car or even an entertainment film, then your personality will come out in everything you make whether it’s playing with a ball, talking in a bar or paining a picture. CW: The film is set largely in your house with your children. Do you think films can be more personal if they’re free from narrative? CR: My previous film, Silent Light, is more personal to me than this one. It’s in a language I don’t speak, in a religion I don’t follow, in a country that’s not mine, but it’s more personal because I can identify very deeply with the internal conflict of that man. Post Tenebras Lux is very autobiographical. The people that are there and a lot of the external things that happened are things that I have seen, experienced or have happened near me. But the way the two main characters experience life is not my own at all. CW: The film focuses closely on a family unit, but there are other images juxtaposed onto that, like the man decapitating himself. Were you trying to draw a parallel between personal and national consciousness? CR: Definitely. It also came, to a certain extent, as a bi-product. Like I was saying about me doing certain things and certain ideas will follow that will be present in whatever is made; the same thing goes for the political and sociological ideas. Everything can be read on a micro level or at a macro level. At the micro level, the film is about his [the protagonist’s] family, his fear, his blindness, his wounds and then, on the macro level, there’s the other man who’s desperate and keeps creating ruins around himself; he ruins everybody’s life and he just can’t take it so he ends it all. At that point, it’s totally human. If the film was set in England, it would happen the same way but, instead of pulling off his head, he would probably jump from a bridge or in front of a tube train. CW: How much of Post Tenebras Lux is about a clash of sensibilities between Western and non-Western ideals? CR: Basically, Mexico is made up of Western Mexicans. How would I define this? Of course, it can be your culture; they will have certainly have heard Bach and have read Joyce and this kind of thing. It’s in the way you conceive the world, how you understand the fact that you exist. The Western part goes to separation. When you grow up, you begin to acquire consciousness of yourself and you detach from everything else whether it’s nature or other people. That’s a Western way of thinking. It came to its summit with the Century of Light and the total triumph of reason. The couple in the film fit into this. Then there are other people who have lived here [in Mexico] for a long time who have a different way of understanding life which doesn’t go to detachment and separation from the rest. CW: Let’s talk about that brilliant opening scene. It almost works as a perfect encapsulation of the film. CR: I decided to make it in the rainy season because it’s also thunder season and I wanted that transformation of nature from broad daylight into night; all the beauty and fear that can bring. Basically, I wanted it to feed into the idea of Western detachment and separation as well as loss of innocence. 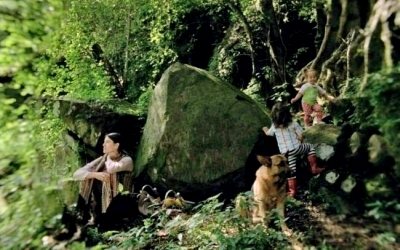 In this film, the only beings at peace are the trees, plants, animals and children. So this girl is there among the animals and dogs enjoying herself, she doesn’t know who she is or where she comes from; she’s just 18 months old. Already, different from all other living beings at that moment, she’s naming things; she says “dogs”, “donkeys”, “cows”. She’s a human being, and the difference between her and the rest is that one; she realises she exists and she can name things, she can detach herself from the rest. CW: Post Tenebras Lux is shot in 1:33 with blurred edges. Did you know that was something you wanted to experiment with from the beginning? CR: I had the idea of the blurred sights in the beginning because I wanted to be far from the digital images of today which are so sharp. But then, when we were installing that lens for blurred images, we learnt that, by misplacing the lens, we would have a double image at the sides. And I thought from the moment I saw them that they were beautiful images and that I wanted to keep them in the film simply because the fact that you are making a film permits you to see things differently. CW: Dreams, fantasy and reality are all given equal importance in the film. How important was it to achieve that effect? CR: Very much so. At a psychological level, the film is very much about experiencing life. And experiencing life does not just mean experience of the present conscious but also the imagined future (i.e. what could have been if certain things had occurred), what you long for, your dreams, your souvenirs and, more importantly, the acknowledgement of reality being everything else that you cannot see or experience. So, you know that I am here and the moment we hang up I will be eating with my family and you too. We wouldn’t be able to acknowledge or understand that in reality, so that level which is rarely talked about but is so obvious is there too. And that’s why the rugby is there in the [final scene of] of the film. I don’t understand why people got so confused with that. It’s the equivalent of reading the end of a children’s fairytale saying “they lived happily ever after” and the kingdom survived. CW: What can we expect from you next? How do you follow a film like Post Tenebras Lux? CR: For me, each film is an act of life, of existence. I never think of myself as making a career out of this. Everything just reflects a moment of my existence, of my being. So I don’t know what I’m doing next and I don’t care much. Whatever I do, there will have to be a deep, powerful, internal need and will come out when it has to come out. Carlos Reygadas’ Post Tenebras Lux is released on DVD and Blu-ray this week, courtesy of the ICO and Verve Pictures.